"Oh, no! Am I getting fat?!" What do you do? Ignore it...deny it...swear to cut out the cream on the morning latte...sweat it off at the gym? Yep, fat dogs are cute. But carrying extra pounds can have extremely detrimental health effects and can lead to premature death. High blood pressure, joint pain, and increased risk of injury and heart attack are just a few of the consequences of ignoring those few extra pounds on your adorable pooch. Feel the pet's ribs. You should be able to easily feel individual ribs. There should be a slight amount of fat over them, but each rib should be distinct. If you can see the ribs, the pet is too thin. If you can't distinctly feel the ribs, the pet is overweight. If you can't feel the ribs at all, your pet is obese. Look at your pet from above. 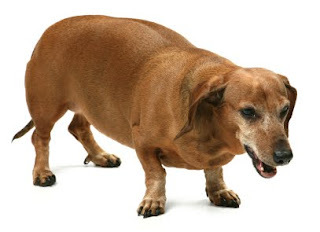 Your dog should have a definite waist behind its ribs. If the waist is extremely narrow or if bones protrude, the animal is too thin. If there is no waist, the dog is overweight. 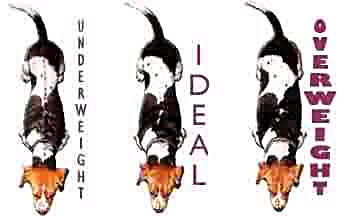 If the waist area is wider than the hips or ribs, the dog is grossly overweight. 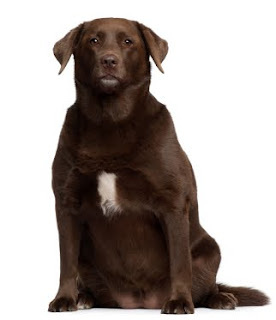 Pet owners are often shocked and embarrassed to learn that their pet is overweight. It's hard for people to admit that their pet has a problem. We see our pet's health as a reflection of our love for them. But becoming aware of your pet's health risks and taking control of it is the most important thing. Changing their diet and exercise routine is a great way to show your best friend that you care.